We offer world class customer service to answer any questions you may have in your hair replacement journey. You can reach out to us via Facebook messenger, Text, Call, Email, etc. we always have hair specialists to support you. Do I need a consultation to order hair? Absolutely not! If you don’t want to wait and know you already want man hair, you can simply place from the “stock hair” order section of our website. You will then skip to design consultation with one of our experienced consultants. For those who want to find out more, please feel free to book an initial consultation by clicking the contact us page. I can’t find my color when placing my order? After placing your order a consultant will reach out to you to arrange an online design consultation. During this consultation is when you discuss customizing your hair including, size, color preference, density, wave%, style, density, base material,etc. We match the hair to your lifestyle and activities. For custom orders we will have you send a sample of your hair and a mold of your temple so we can provide the perfect match and size every time. How long can I wear the hair for? Unlike a traditional wig or toupee, Man Hair does not spend the night on a standard or in a drawer for all to see (embarrassing and degrading to your self confidence), once attached you can wear up to 6 weeks at a time. We do however, recommend removing every 3-4 weeks for a re-groom (clean) but this will vary depending on your lifestyle and also regards to natural oils, sweat, etc.. Our experienced consultants will take you through this process and regrooms typically take 20-30 minutes. Can I shower/ swim in it? Yes! One thing we were passionate about was being able to do normal things while wearing our hair. You feel and treat it as if it were your own so you don’t have to feel embarrassed when out with family or friends on a vacation retreat. If however, you’re very active and sweat often we may suggest a re-groom on a more regular basis. Depending on options you choose and the care you provide and the lifestyle you live every system has an average lifespan of 4 months to 1 year before a replacement is needed. Depending on how well they are cared for some clients have made them last even longer than 1 year. Can I use styling products? Yes you can! We advise using lightweight water based products gels and hairsprays to hold shape. You treat this as your normal hair and most people go for a look they preferred when they had hair before and style the same way. Avoid heavy duty waxes and always ensure if using any products that you wash/wet the hair before trying to comb it out. We have carefully selected products we recommend and offer them here on this site for you to source easily and you know it will be best suited for our Man Hair. 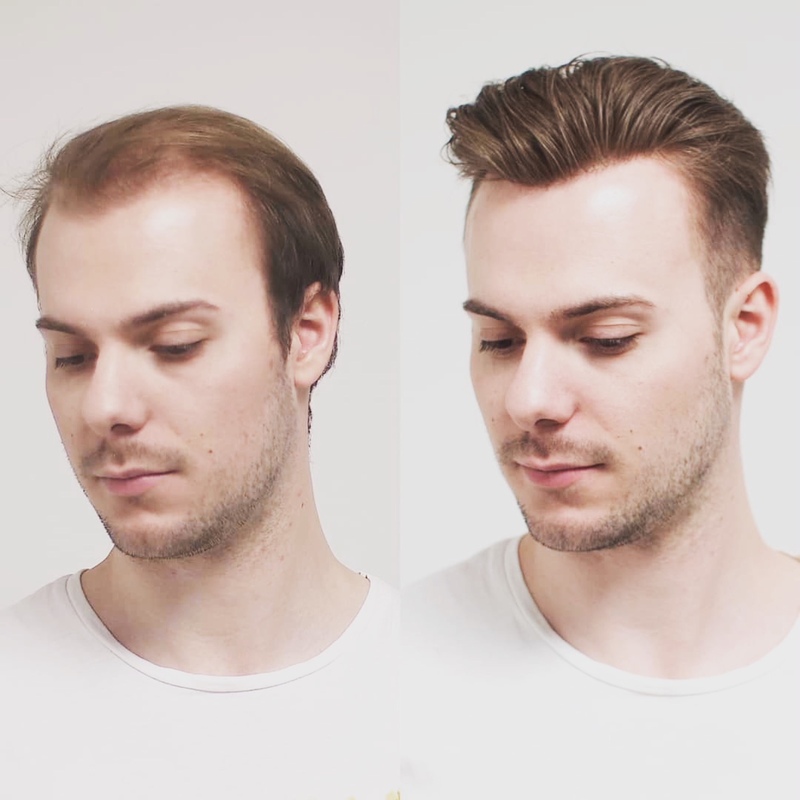 We advise on average that you remove your Man Hair to clean and replace the adhesive every 3-4 weeks. Of course. this can sometime vary depending on how active your lifestyle is, the more active the more frequently a maintenance session is advised. Again, we will walk you through this process and provide a brochure for you to do these yourself in the privacy of your own home. Typically a re-groom will take 30-45 minutes. Can I do the re-groom myself? Yes! We strongly encourage every client to learn how to complete the maintenance themselves in the comfort of their own home. Avoid those high costs from going to a professional salon. Each maintenance session will take between 30-45 minutes. Will it ever fall off? No! As long as you replace the glue or tape bond as instructed (depending on the adhesive you’re using) every 3-4 weeks, the hair will be securely fixed and won’t come off without using the solvent release spray. You work out, shower, swim, play sports, life a NORMAL lifestyle in our hair. We want you to live your life and not worry about your hair. As previously mentioned if you’re extremely active you may need to complete maintenance sessions more frequently to ensure a secure fixing. Edges may begin to lift slightly as an indication a maintenance session is due. Will it damage my natural hair? No, all our adhesives are medically treated and skin safe and produced from the highest qualify certified hair labs, allowing your scalp to breath and not affect natural hair growth or increase the rate of hair loss for the hair you do have. You can shower as normal, you do not need any special shampoos or conditioning treatments though we do offer our products that work best and will increase the life of your Man Hair. We suggest if you source your own product that it be made for color treated hair and also sulfate free. We do advise that you do not scrub the hair. As there is no natural oil reaching the hair from your follicles it does not get greasy. Scrubbing causes the hair to dry out quicker and can cause matting. Combing through conditioner on a semi-regular basis is advised to keep the hair fresh with occasional shampooing. We also advise using a leave in conditioning spray to supply moisture throughout the lifespan of the hair. When placing your first order you have two options, STOCK hair only and our CUSTOM ORDER. The only difference is how we create the size, shape of the base and hairline. All other options including color, density, texture, wave% are still fully customizable for both. Our ‘hair only’ works on our standard shape/contour but using your measurements. All CUSTOM ORDERS will have their hair designed from a template. The temporary template can be created yourself during design consultation and shipped to us. The CUSTOM ORDER includes in dept consultation to ensure you get the best fit and look you want and also the emotional support to walk you through this process for the first time. All future replacement orders for perfect fit will be at the reduced cost of hair only. How much does Man Hair cost? The initial cost can vary depending on the package you choose. If you opt for ‘stock hair only’ the total cost will be $399.00 per piece. If you choose our Man Hair CUSTOM ORDER this includes a full design consultation with our hair experts, template and contour measurements kit sent to your door as well as sending in your hair color for the perfect match. The initial CUSTOM ORDER price including all the support will be $799.00 and includes your first hair system. Man Hair Customer Order hair systems will then be $399.00 per piece going forward for future orders. Yes! We understand this is an investment in yourself, your confidence and your future. Many new wearers are unsure where or how to start and that is where we come in. Instead of investing $3,000 to $4,000 initially at professional salon, you will get our expert services and support in the comfort of your own home for a lot less. We can discuss progress payments for you if you are on a budget. We can also offer larger discounts if you buy more than 1 system at a time. We also offer a $100.00 referral bonus for you and your friend whenever you refer someone to our store.